A firebox is the inside area of a fireplace where the fire burns. This area, on brick and mortar chimneys, is typically constructed with firebrick and refractory cement. Fire brick is a special type of brick made to have high heat resistance. Refractory cement is a type cement made with aggregates that will not expand when heated allowing to be fireproof. Fireboxes can also be made of fire brick or refractory panels, which are inserts that are set in a firebox and provide the same insulation as fire brick and refractory cement. Designed to look much like fire brick and mortar some home-owners may have trouble identifying which it is that they have. These panels are custom fit or cut to meet the specifications of your firebox and occasionally need repair or replacement. Inspect your firebox yearly for signs of needed repair or maintenance. Also be sure to check out your flue liner for damage or need for cleaning. Signs your fire-box may need repair. Note the deteriorated joints between the firebrick. This firebox is in need of repair. 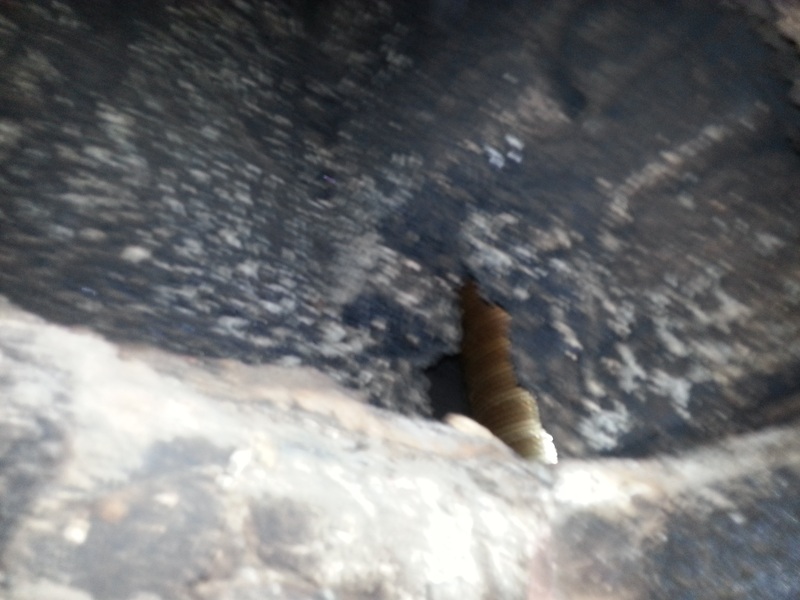 This picture shows a missing brick inside a firebox that opens into area where gas appliances are vented. 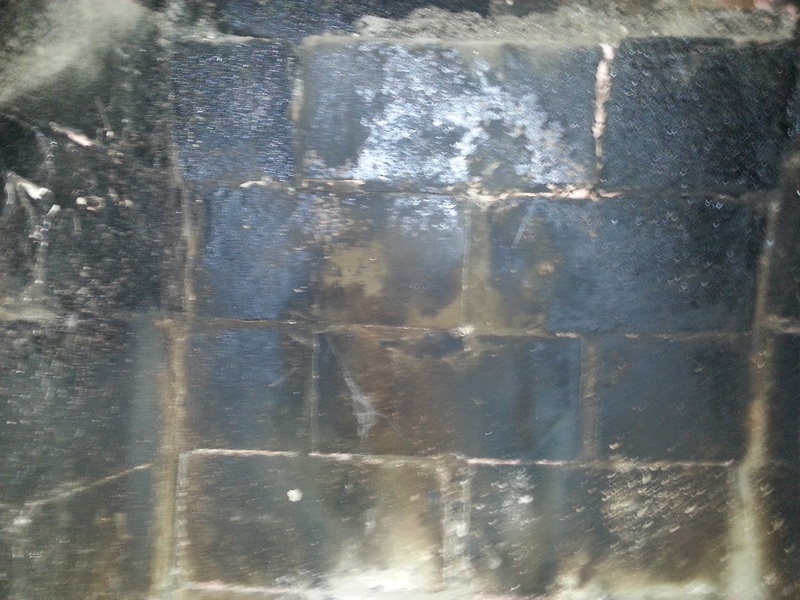 Fireboxes, like any other masonry structure, occasionally need to undergo maintenance and repair. The most common repair needed is firebox tuckpointing. Very similar to the process of tuckpointing, deteriorated mortar joints are removed, the area is cleaned and new refractory cement is applied. Other common repairs needed are repair or replacement of cracked, damaged, loose or missing firebrick. In these instances the bad brick is repaired or replaced as needed. Signs of failing fire brick panels are visible cracking, spalling or deteriorating of the panel. More often replaced than repaired, these panels are much thinner than fire brick and do not hold the same life expectancy. If you’re unsure of the condition, feel free to give us a call, text or email us with pictures and or questions, we’d be glad to help! If you notice any cracks, holes, voids, missing or loose brick in your fireplace on your fire brick or refractory panels, discontinue use until the problem is corrected. Lighting fires in a damaged firebox causes concern for house fires and carbon monoxide poisoning. Carbon Monoxide and/or fire can find it’s way between the open cracks and voids in a firebox to cause such damage. If you find yourself in need of firebox, flue liner or chimney repair you can give us a call, text or email us for a Free Estimate! Don’t need an estimate but still have a question? Give us a holler, we’d be glad to hear from you. Posted in Chimney Restoration and Repair, Fireplaces & Flue Liners Repair, Replacement and Installation, Tuckpointing, pointing, re-pointing. Mortar joint Repairs and tagged box, Brick, estimates, Fire, Fire brick, firebox, fireplace, mortar, pointing, repair, services, St. Louis, tuckpointing on March 24, 2014 by Jacob Thompson. ← Did he just say Chimley? What’s that?